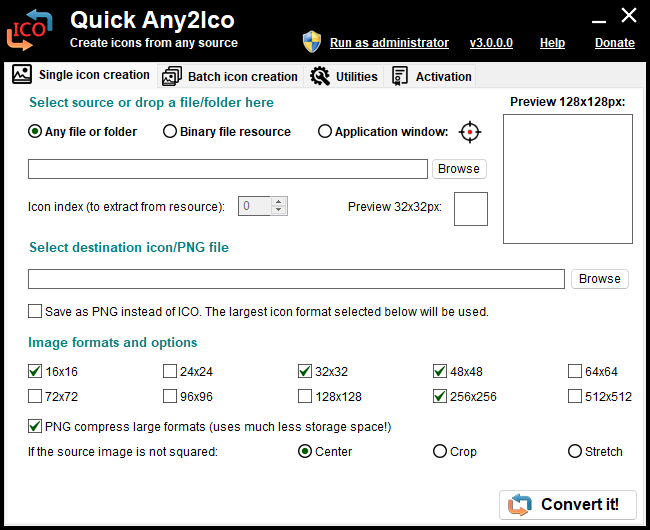 Quick Any2Ico creates high quality icon files from any type of image file or from the resource of a binary file. It can also be used to add or remove image formats from icon files. GUI or command line support available. Fixed important bug: The application was crashing when clicking th Browse button, in the source file group, if Extract from binary file resource was selected. Can this create ico files from several png files with different dimensions? As far as I know Quick Any2Ico can only convert one image at a time with a single resolution chosen- it cannot process multiple images with different resolutions simultaneously. ozok wrote: Can this create ico files from several png files with different dimensions? I guess I could only use a program so many times before I felt guilty that it wasn't in the database. Quick Any2Ico overwrites existing files without warning. If you'd told me this was a common practice, I would have thought you were crazy but you've been running these tests for a while now. Certainly I can see this coming up once in a while just because of some ebarassing or extremely small tweak but I can't figure out why this is happening so frequently?